Raheem Sterling has spoken out against the "unacceptable" racist abuse of England players during their 5-1 win in Montenegro. Racist chanting was directed at a number of players, including Danny Rose, by local fans during the Euro 2020 qualifier in Podgorica. Eighteen-year-old Callum Hudson-Odoi, who was making his first international start for England, said he could hear fans making racist noises. Sterling called on football's authorities to crack down on racism: "A couple of idiots ruined a great night and it is a real sad thing to hear." Uefa, the organisation in charge of European football, said "disciplinary proceedings" had been opened against Montenegro with one charge for "racist behaviour". The case will be dealt with by Uefa on 16 May. BBC Radio 5 Live commentator Ian Dennis said he heard racist chants when defender Rose was in possession of the ball after only six minutes. 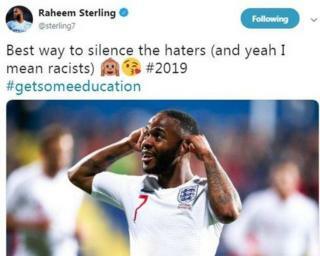 Sterling scored England's fifth goal in the 81st minute and celebrated by putting his hands to his ears, which he later said was a response to the racist abuse. In injury time Rose was given a yellow card after making a strong tackle on Aleksandar Boljevic, with more racist chants aimed at the 28-year-old. Southgate added: "There's no doubt in my mind it happened. I know what I heard. It's unacceptable. We have to make sure our players feel supported, they know the dressing room is there and we as a group of staff are there for them." Raheem Sterling told the BBC: "I don't think it was just one or two people that heard it, it was the whole bench. There should be a real punishment for this, not just the two or three people who were doing it - it needs to be a collective thing. "This place holds 15,000. The punishment should be, whatever nation it is, if your fans are chanting racist abuse then it should be the whole stadium so no-one can come and watch." Why was England v Switzerland in black and white for 25 seconds?